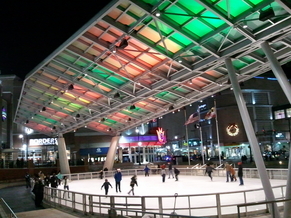 The new outdoor Silver Spring Ice Skating Rink is in downtown Silver Spring at Veterans' Plaza, surrounded by great restaurants, shops, and plenty of parking. It is in a convenient location for the Washington DC Metro area. Parking is free after 8pm on weeknights and all day on weekends!